The Wall has seen many adaptations, official and unofficial, with everything from the well-known film and the recent Roger Waters opera to lesser-known releases like the 2001 bluegrass adaptation, and Minnesota's Twin Cities Ballet is teaming up with Floyd tribute band Run Like Hell for another take on the seminal album. The show premiers tonight, March 1, with standby tickets available at the box office. With a release date set and preorders available for Is This the Life We Really Want?, Roger Waters has released the single Smell the Roses into the world. The track is surprisingly evocative of Animals and Wish You Were Here, and we'll be eagerly looking forward to hearing the rest of the album. Here's a direct YouTube link in case of issues with the embedded video below. Roger Waters recently spoke with Rolling Stone about his upcoming US+Them tour and the new album, Is This the Life We Really Want?, that will come out during the tour. The piece is short but covers a bit about the idea behind the tour, the inspirations for the album, and some of the process that led to it (Mr. Waters was apparently convinced by his producer, Nigel Godrich—a veteran of numerous Radiohead albums, among many others—that a concept written as a theatrical radio play was "less than ideal" for a rock album, but notes that they were able to adapt songs from it). Is This the Life We Really Want? will be released on June 2 on CD, vinyl, and digital download, and will be available for pre-order April 21. Roger Waters and Nick Mason spoke with the Victoria & Albert Museum about the new Pink Floyd exhibition opening. The museum describes the exhibit, called Their Mortal Remains, as "a spectacular and unparalleled audio-visual journey through Pink Floyd's unique and extraordinary worlds, chronicling the music, design and staging of the band, from their debut in the 1960s through to the present day." The exhibit opens May 13 and tickets run from £20-24. Teaser video released for "Is This the Life We Really Want?" 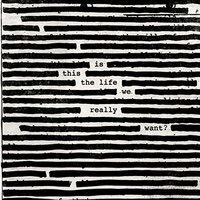 Details for the upcoming Roger Waters album are still scarce (though it's probably pretty safe to assume from his recent comments that its lyrical content will be political), but it does now have a title: Is This the Life We Really Want? The name was posted with a teaser video to Roger's social media pages (Facebook and Twitter), showing off, for at least part of one track, a pretty classic Floyd vibe. With his tour starting in May, more details are sure to come soon. Another box set/collector's item was announced today in the form of Pink Floyd, The Early Years 1965-1972. The set contains 10 CDs, nine DVDs, eight Blu-Ray discs, five 7" vinyl records, and memorabilia including concert posters, flyers, tickets, and programs. Of course, Pink Floyd had no studio recordings before 1967, so presumably the 1965-1966 era is covered with that memorabilia. For those unable or unwilling to purchase a huge box set at a huge box set price, a 2-CD release titled Cre/ation - The Early Years 1967-1972 will also be released. While some of the CD releases's recordings were previously available on various compilation albums, others, like those from the BBC Sessions, were previously available only as "bootlegs". Newly remastered versions of "Childhood's End", "Free Four", and "Stay" are also included, as is a very early predecessor to "Echoes" from its time as a multipart composition called "Nothing". Both hit stores on November 11. According to Rolling Stone, the tease is for a classic rock "mega-festival" in Indio, Calif. (presumably at the Empire Polo Club), home of the Coachella festival. Neil Young is also rumored to be performing, although he has apparently opted out of the social media promotion route. More details are certain to come soon. UPDATE: All six acts (including Young) are now confirmed for the event, called Desert Trip, running October 7-9; tickets go on sale Monday at 10am PDT. SECOND UPDATE: A second weekend, from October 14-16, has been added as well. 2017 marks the 40th anniversary of the Montreal stadium concert that led Roger Waters to write what's arguably the band's most significant album, The Wall. He returned to the Olympic Stadium there to officially announce the rumored Another Brick in the Wall—The Opera, to be performed by Opéra de Montréal in March 2017. In an interview and video with the Montreal Gazette, Waters explains the album's background in the alienation from the audience that he felt at that show and talks more about the process of adapting the music to opera with the help of symphonic composer Julien Bilodeau. Some pre-sale tickets are on sale as of today; they can be purchased at Opéra de Montréal's site. Scotland's The Herald reports on a play about Syd Barrett premiering in October in Glasgow. One Thinks of It All As a Dream, commissioned by the Scottish Mental Health Arts and Film Festival and written by Alan Bissett, will focus on "the influences and pressures on his mind and music" and not explicitly on his drug use, although it seems that would have to be a component of it. Still, it seems that Bissett hopes to examine Syd the person in more complexity and look beyond the famous (or infamous) "madcap" narrative, which should be interesting to any fan of early Floyd works. The Scottish Mental Health Arts and Film Festival opens on October 10, World Mental Health Day, and runs through October 31.